Oklahoma State’s T. Boone Pickens Stadium Synthetic Turf Field Continues to Thrive with the AirDrain Drainage Installed since 2006! 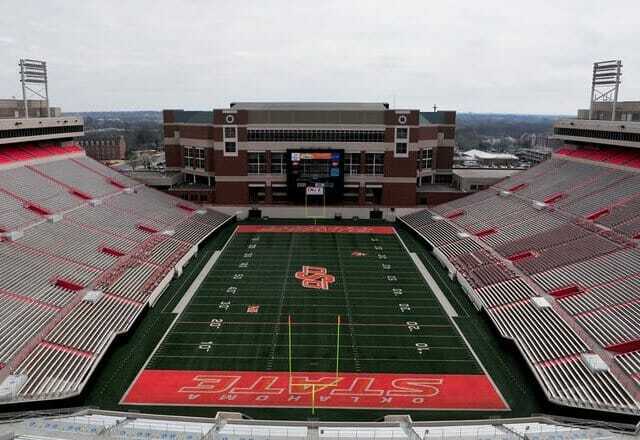 T. Boone Pickens Stadium now utilizes a state of the art sustainable designed synthetic turf athletic field. Provided in part by AirField Systems who manufactures AirDrain a high performance drainage system for sports fields. The American Institute of Architects (AIA) recently published AirField Systems continuing education program. Titled “Synthetic Drainage for Sustainable Design In Modern Sports Field Construction.” Please read further to find out what the athletic field industry already knows. T. Boone Pickens Stadium now utilizes a state of the art sustainably designed synthetic turf athletic field. Provided in part by AirField Systems who manufactures custom made high performance drainage for synthetic field turf. The American Institute of Architects (AIA) recently published AirField Systems continuing education program titled “Synthetic Drainage for Sustainable Design In Modern Sports Field Construction.” Please read further to find out what the athletic field industry already knows… AirField Systems was a proud participant of the state of the art athletic facility at Oklahoma State University. AirField Systems provided AirDrain the subsurface synthetic drainage system below the artificial field turf at T. Boone Pickens Stadium. AirField Systems has over 400 installations including the University of Phoenix Stadium home to the Arizona Cardinals, the number one ranked football field in the NFL the past 3 years. The Arizona Cardinals selected the AirField System after an intense 6 month study that included 20 of the top competing drainage systems. Other notable AirField installations include the Baltimore Ravens practice facility as well as two-thirds of the Big 12 South programs including installations at Oklahoma University, Texas A&M, and Baylor University. With an AirField System installed T. Boone Pickens Stadium enjoys advantages that only a modern synthetic drainage system can provide. With 100% vertical drainage under the entire synthetic turf surface allows for play ability under almost any weather conditions. The AirField drainage system exhibits a constant never changing GMAX adding to both player and unmatched field performance. The 92% subsurface air void space created by the AirField System can allow for capture, storage and reuse of storm water. Proving it’s sustainability multiple field turfs can be replaced without replacing the AirField System. These are only a few reasons why Oklahoma State University selected the AirField System for T. Boone Pickens Stadium. Adding to the credability and growing popularity the American Institute of Architects (AIA ) recently published AirField Systems online continuing education program titled “Synthetic Drainage for Sustainable Design In Modern Sports Field Construction”, hosted by Green CE. AirField Systems also manufacturers, a full line of grass paving solutions for fire lanes, temporary and/or overflow parking, common areas and walkways. As well as a patented drainage system for green roofs and golf course drainage. AirField Systems has over 30 years of experience and is a leader in sustainable site design. With over 400+ installs, thank you for letting us bring our expertise to your community.